Updated: As one year draws to a close, it's only natural that we all want to know what new technologies are in store for us in 2009. How many cores will your CPU have? How fast will they be? What will be powering PC graphics, and what type of memory will be the next must-have? The problem is that top technology firms are already beavering away on products and kit that will supersede next year's star buys. So we set ourselves another task – to discover what's over the horizon. Is next year's kit part of a bigger trend or a gathering revolution in technology? Read on to explore the PC's near and distant futures. The most hyped and heralded Intel technology for 2009 is the Core i7 processor, which was formerly codenamed Nehalem. Initial product launches will be aimed at high-performance servers; desktop and laptop versions will appear in the second half of 2009. From information provided at the Intel Developer Forum in August and the results we've seen in our lab tests, we can confidently say that Core i7 is the biggest architectural advance Intel has made since the Pentium 4 launched in 2000. The architecture is scalable from two to eight cores and offers HyperThreading technology – the same system used in some Pentium and Xeon processors – to permit two threads per core. Energy efficiency is high on the list of benefits too. Rafts of architectural features provide increased performance per core at the same clockspeed (so more performance per Watt), and an innovative 'Turbo' mode works hand-in-hand with an improved sleep facility. Unused cores can be put to sleep, as could those in Core 2; but whereas Core 2 processor cores still used some power in sleep mode, the unused cores in Core i7 will consume virtually no power. And there's more; to provide additional performance for applications that are not multithreaded and hence not able to take advantage of multiple cores, the Core i7 will boost the clock frequency of the remaining core while still keeping the chip within its design power consumption. Intel isn't saying exactly how much of a boost the remaining core will get, but there are suggestions that it will be from 3.2GHz (the highest launch speed) to 3.4GHz or even 3.6GHz. The introduction of Core i7 is an example of – in Intel speak – a 'tock'. Intel's so-called 'tick tock' model involves introducing a new generation of silicon technology and a new processor architecture in alternating years. This means that 2009 will be a 'tick' year and, in particular, it should be the year that Intel introduces its 32nm process. Intel was not willing to comment on whether the new process technology will permit an increase in clockspeed, even if only in Turbo mode. 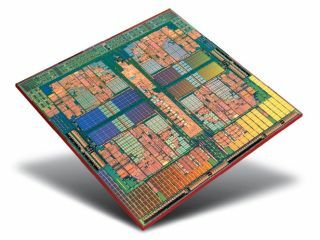 AMD was not as forthcoming on its plans, initially only telling us that its main focus for 2009 will be on the 45nm technology transition. It's pertinent to note that AMD are a whole generation behind Intel. Despite this initial reticence to talk about futures, Senior Product Manager Ian McNaughton did respond to a couple of questions. His main revelation was that six-core processors will join triple- and quad-core products in the Phenom processor line up during 2009. Having seen that Intel is looking to boost clockspeeds when some of the i7's cores are idle, we tried to get the lowdown on whether AMD has any plans in this area – or whether the megahertz wars are truly over. Ian's response was not surprising given that AMD hasn't quoted the clockspeed in its part numbers for many years. "For AMD, it has never been about frequency; it's always been about innovation. Buying a PC based simply on the speed at which the CPU runs is misleading, and users who only focus on that ingredient tend to have a poor PC experience."